The weather in San Francisco is starting to feel more like fall as the fog looms over the crisp mornings and chilly nights. And as I fight the flu, this is the one thing I am craving. I love this soup for so many different reasons! It's a beautiful soup that is just as delicious as it is filling. 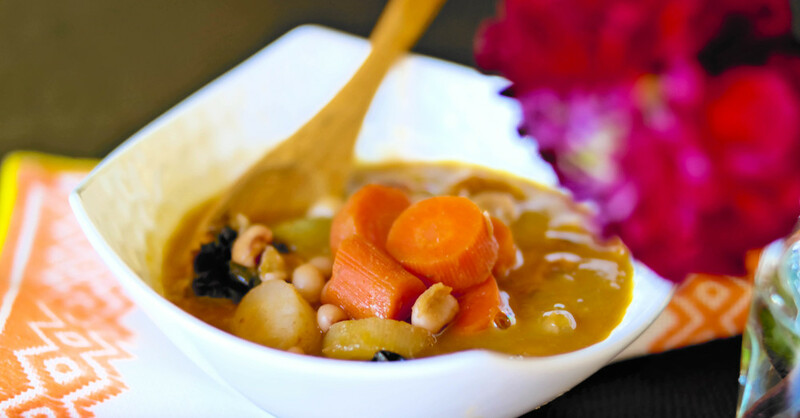 It is incredibly nourishing from all the sautéed vegetables, warming broth and hearty beans and mushrooms. Whenever I catch the flu the last thing I want to do is cook and that is why I particularly love this soup! The only thing to do is sauté a few vegetables for 15 minutes and then add it to a large pot to cook off for a few hours! I like to wind down as I sauté the veggies, stirring a few times, and take a nap as I wait for the soup to finish cooking. As it cooks, the beans become tender, the spices infuse the vegetables and the broth absorbs all the wonderful flavors that are stewing away. I wake up to such a beautiful aroma that puts my mind and body at ease. This comforting soup is perfect for winter as it has many vegetables that house powerful flu fighting vitamins! The stewed kale, bok choy, tomatoes, and carrots are all high in vitamin C, which is exactly what you need when fighting the flu. Vitamin C is an antioxidant, helping to boost your immune system and recover from the flu quicker. Bok choy alone contributes 75% of your daily intake of vitamin C with every 100g! The kale and carrots are also high in vitamin A, which can help to boost your immune system when you feel a cold coming on. Vitamin A is more readily absorbed into your body when paired with foods high in healthy fats, such as olive oil. I like to add a drizzle of olive oil on top to increase my vitamin A intake. I also love to enjoy this alongside a warm cup of water, squeeze of lemon juice and a teaspoon of honey to help coat my sore throat. If you have the flu or know someone who does, try making this soup for them as it is a beautiful way to show you care and will just make their day a little bit better. Enjoy! I highly recommend using dry beans but if you are short on time use 3-4 cups of canned beans and add them towards the end of the cooked soup, last 30 minutes or so. Now warm the olive oil in a large saucepan and cook the diced onions and crushed garlic until tender, about 5 minutes. Add the chopped carrots, celery and a few pinches of salt to the saucepan and sauté for 15 minutes. In a very large pot add the vegetable stock, chopped tomatoes, dry beans, sautéed vegetables and cook on medium-high heat for 2 ½ hours. Now add the chopped kale, chopped mushrooms, bok choy leaves and cook on medium heat for the remaining 30 minutes, until the beans and kale are tender. Add chili flakes, salt and pepper to your liking and enjoy this nourishing soup!